Need a haircut? 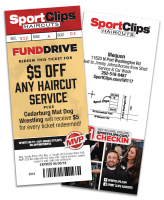 Visit the Mequon SportClips location. Use this awesome ticket to receive $5 off a service and with every ticket redeemed, $5 will go to the Cedarburg Matdogs. Everyone wins!